The DA 350 from Neal Manufacturing makes up half of the manufacturer’s new Asphalt Road Preservation Package. The drivable machine makes quick work of curb-and-gutter streets, handling the cleaning prep, cutting in, squeegeeing and spraying. "From municipalities to contractors who have a wide customer base, equipment that can efficiently handle a variety of sealcoating jobs is a must," said Tripp Farrell, Neal Manufacturing president. 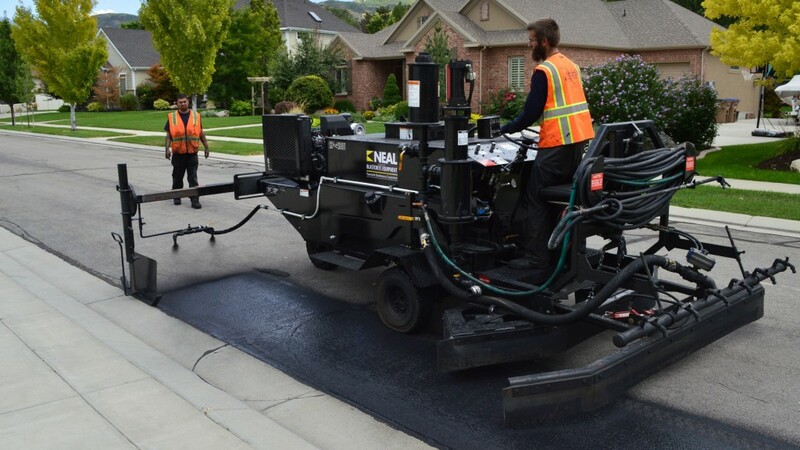 "Our package ensures that whether they're sealcoating a local street or a 5-mile stretch of highway, they have dependable equipment to efficiently achieve high-quality results." The DA 350 is a three-wheeled self-propelled sealcoating machine that features a built-in, high-powered blower and AutoTrim, an automatic cutting-in attachment. These features allow contractors to complete prep work along curb-and-gutter streets as much as seven times faster than what can be achieved manually. Operators can use the machine's heavy-duty diamond-shaped squeegee assembly to effectively apply sealcoat material into asphalt surface voids, then, apply the second coat with the DA 350's spray bar for a smooth finish. This application method is the most effective way to completely seal asphalt for a finish that lasts as much as 40 percent longer than a job done with two spray coats. The High-Volume Road Maintenance Vehicle features Neal Manufacturing's Generation IV pump that delivers infinitely variable outputs from 0-150 gpm, even with larger aggregates mixes. "Optimizing road friction characteristics is a top priority for Departments of Transportation and the contractors involved with road preservation. The challenge comes with the equipment and having the right machines that can handle the large aggregates necessary for enhancing road friction," Farrell said. "That's why we designed the Generation IV pump to take on more aggregates and larger aggregates than any other pump on the market." With the High-Volume Road Maintenance Vehicle operators can cover up to 14 feet in one pass at a rate of 150 gpm — the industry's highest. In-cab controls allow for on-the-go spray bar height adjustment, ensuring optimal distance between the nozzles and road surface is achieved as the truck shifts weight and moves from full to empty. Individual nozzles can also be controlled from the truck cab, giving contractors the flexibility to adjust the spray area as needed, whether alternating tips or only using one side of the dual spray bar. The Generation IV pumps on the High-Volume Road Maintenance Vehicle allows operators to transfer 3,000 gallons of material from storage tanks in as few as 20 minutes, twice as fast as standard pumps. Neal Manufacturing designed the pumps with heavy-duty features, including robotically welded pump housings and industrial-grade hydraulic cylinders for extreme durability and longevity. To ensure customers know how to properly operate and maintain the machines, Neal Manufacturing offers free training seminars at its Anniston, Alabama, location. All machines are tested before being shipped to its customers.